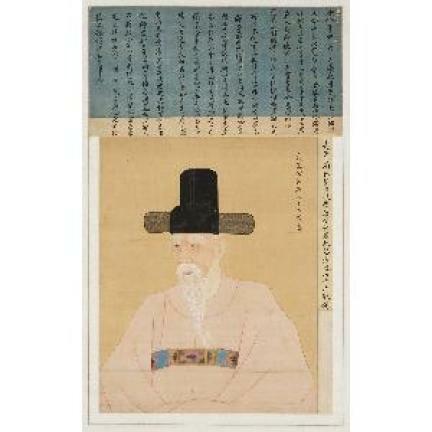 조선중기 대표적 학자이자 문신인 미수 허목(眉叟 許穆, 1595-1682)의 초상으로 오사모에 담홍색의 시복(時服)을 입고 서대(犀帶)를 착용한 좌안7분면의 복부까지 오는 반신상이다. 화폭 상부의 제발문에 따르면 1794년(정조18) 정조가 허목의 인물됨에 크게 감동하여 그 七分小眞을 얻고자 채제공으로 하여금 사람들과 의논하도록 하였으며 이에 은거당(恩居堂, 1678년 숙종이 하사한 집)에서 선생의 82세진을 모셔다가 이명기가 모사한 것이라고 한다. 영정의 오른 쪽에는 채제공이 당시에 쓴 표제가 붙어 있다. 이 은 생시 진상은 아니지만 현재 원본이 전해오지 않는 실정에서 17세기 대표적인 사대부초상화의 형식을 보여줌과 아울러, 노학자의 문기어린 풍모를 잘 전달해낸 당대 최고의 어진화사(御眞畵師) 이명기의 솜씨를 볼 수 있다는 점에서 가치가 높다 하겠다. This half-length portrait depicts Heo Mok (1595-1682), a renowned scholar-official of the mid-Joseon Dynasty, dressed in the pale pink everyday robe of an official, in a three-quarter view from left. The old scholar, with his famous white eyebrows, is wearing a high black silk hat and a sash. 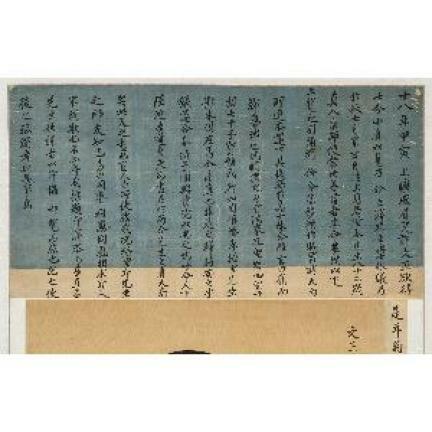 According to the colophon at top, King Jeongjo was greatly impressed by Heo Mok’s personality and in 1794, the 18th year of his reign, asked Chae Je-gong to find out how he could attain a three-quarter view portrait of him. 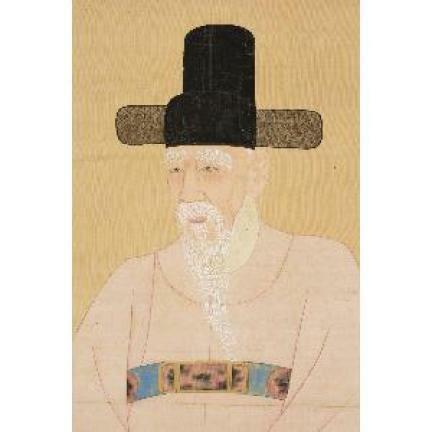 Therefore, a portrait of Heo painted when he was 82 was brought from his old house, Eungeodang (literally meaning “House of Reclusion,” presented by King Sukjong in 1678), so that court portraitist Yi Myeong-gi could make a copy. The title along the right edge was calligraphed by Chae at this time. Although posthumously produced, this portrait is considered an important work representing the 17th-century literati portrait style, since the original is not handed down. Successfully conveying the subject’s character, it shows the outstanding ability of Yi Myeong-gi, the most celebrated palace portraitist of his time.